How do I Choose A Wardrobe? Choosing the right wardrobe for your bedroom is essential. But before you start looking at new wardrobes, take a look at your old. Shopping for a new wardrobe is an opportunity to solve old problems. Why buy a new wardrobe if it isn't an upgrade from the old one? Depending on your preference for clothing storage, you may decide that you need more space to hang your clothes than you do space to fold them. 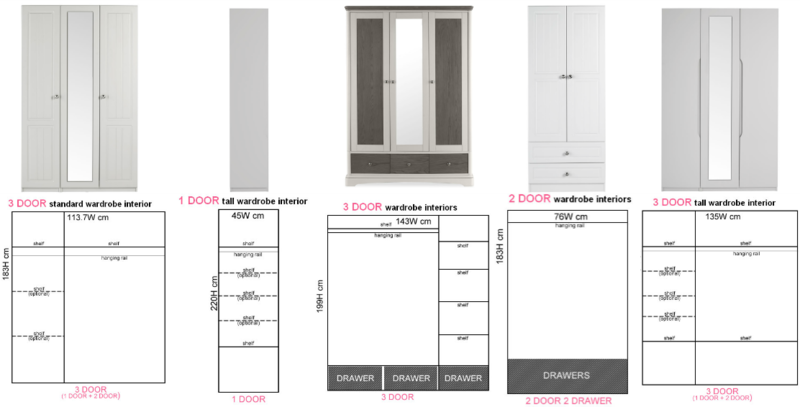 Different combinations of interior storage space are available with all sizes of wardrobes. Choosing a modular wardrobe allows you the flexibility in mixing and matching shelves, drawers and hang rail length to suit you. How Big Should A Wardrobe Be? As big as you need! But no bigger than you can fit in your room. If you have a small bedroom, you of all people should know how precious floor space is. So think up. Stop wasting floor space, and start thinking vertically. You will want to accurately measure the space where you would want the wardrobe to go. Make a note of both the ideal minimum and maximum width, depth and height. This will come in handy for when you are browsing wardrobes as you can immediately disregard any that fall a little short or far from your ideal measurements. Also, it is important to make sure that you have enough space to comfortably stand in front of the wardrobe and open the doors and drawers. Again, if you have a smaller bedroom, sliding doors work a treat as they don't swing outward. Wardrobes come in two options: fully fitted or freestanding (out of pure envy, we're going to ignore walk-in wardrobes...). For those with a little more money to spend, you can hire someone to come around, take measurements of your bedroom and design a fully fitted wardrobe and storage unit for your bedroom that will take up the length of a wall. This may be a good idea for rooms with awkward alcoves or odd angles. But a freestanding wardrobe that can travel with you if you have to move home, be sold as second hand if you grow tired of it, or even be passed down to your children if it's a particularly high-quality wardrobe. How To Buy A Wardrobe That Matches My Bedroom? Many people are conscious of buying a wardrobe that matches the rest of their bedroom furniture. If not completely, at least so it doesn't look too out of place. For example, you wouldn't buy an antique armoire elegantly stood tall on cabriole legs if the rest of your bedroom is quite contemporary in its style. Unless you are experimenting with ironic design and brave (or quirky!) enough to be playing with contrasting décor styles. But for the majority of wardrobe buyers, you'd probably just like your wardrobe to "go" with everything else. You're not going to pretend that you're Laurence Llewelyn Bown or Kelly Hoppen. Take a look at the rest of your bedroom furniture. If you notice a lot of oak, your safest choice would be an oak wardrobe. If you notice a lot of pine, your safest choice would be a pine wardrobe. You should also consider the finish of your bedroom furniture. 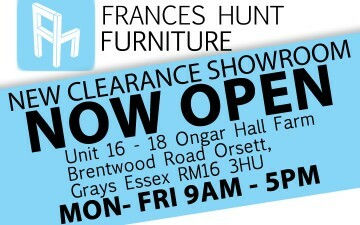 View Frances Hunt's range of wardrobes. See other furniture buying guides.